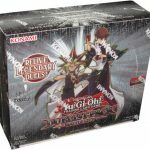 Premium Gold: Infinite Gold is the latest solid gold collector’s set for the Yu-Gi-Oh! TRADING CARD GAME. With something for everyone, Premium Gold: Infinite Gold contains dozens of upgraded cards to bling out your collection plus 21 new cards for your Main Deck and Extra Deck. 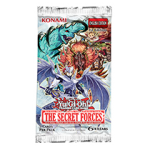 Each 5-card Premium Gold: Infinite Gold mini-pack contains 2 Gold Secrets – consisting of popular cards and several brand-new, never-before-seen cards including powerful monsters for your Extra Deck! Each mini-pack also has 3 Gold Rare versions of popular cards! 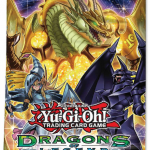 As a special bonus, scores of Gold Rare cards in the set includes former Yu-Gi-Oh! Championship Series Prize Cards Number 106: Giant Hand and Digvorzhak, King of Heavy Industry, now available for everyone to use! Gold Rares are some of the shiniest and rarest cards around, and enshrined completely in Gold colour, including Gold card frames, Gold art boxes frames, Gold text box frames, Gold card names, and for Monsters, Gold level stars! 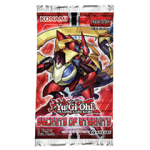 Gold Secrets take all of that and add a Secret Rare Card’s textured foil pattern on top of it! 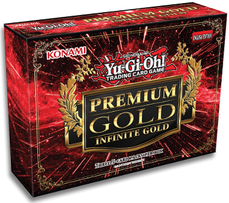 Each box of Premium Gold: Infinite Gold contains 3 mini-packs for a total of 15 cards: 6 Gold Secrets and 9 Gold Rares per box.